Remember my Love Debit Cards? Well, I may have found something better. Yes, I can admit when I've been outdone. 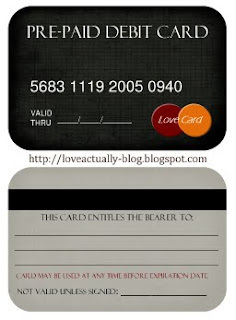 Links2Love sells these fun (and real looking) credit cards. But, you know me. Why buy when you can create your own? You can use them as inspiration for your own design, if you don't mind getting a little crafty. My favorite thing about their cards....the "slogans". Clever, right? Head on over to Links2Love and check them out! these are soo cute!! i should really get them for my boyfriend and give one out occasionally to perk up his day or something. So cute. I love the "Frequent Kisser" card. Brilliant!! =D Awesome idea as usual.. Will be checking them out.. I really like the idea of an indestructible card for my husband's wallet ( I was already thinking of using your version on cardstock), but that weird angel thingy/fairy is going to keep me from buying them. I love your site and am planning to use many of your ideas! Thank you!! Would you please make a version of this blog for MEN!! Then HE could romance ME! !